Being safety conscious is a requirement in all industries, and one of the easiest ways to prevent accidents is to warn pedestrians and traffic of potential danger zones. This has residential and commercial applicability as hazards can crop up in even the most unexpected areas. Being prepared and taking preventative actions are wise moves and responsible institutions will typically arm themselves for such contingencies by always keeping a supply of barricade tape or flagging tape on hand. Hazard tape and flagging tape are durable and economic options when you need to block access to certain areas when there is neither a need nor the time to affix a more permanent barricade. These tapes can be nailed or stapled in place to provide extra anchoring, and they can even be tied off should the need arise. Barricade tape is available in multiple lengths that make it feasible to cordon off areas of virtually any size or shape. In many industries, including construction and surveying, traffic regulation, and emergency response, caution and flagging tapes are a daily necessity. They can be red or yellow in color, with the words “Danger” or “Caution” printed on them in black. Mining industries also make extensive use of caution tapes to warn workers of treacherous locations and potential blasting zones. Hazard tape maintains integrity during harsh weather conditions to effectively point out safe passage when visibility is low. The high visibility of flagging and hazard tapes make them particularly useful in areas of high traffic, preventing accidents by giving passers-by a distant warning of potential hazards. Caution tapes also have an organizational capacity and are often used at events where it is necessary to create cut off zones and safe areas, or to keep an area clear for traffic. 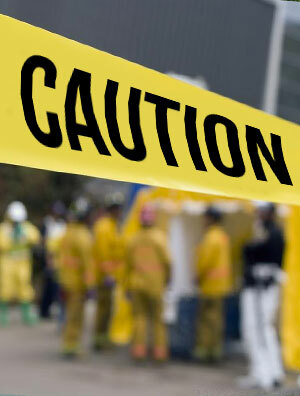 CWC caution tape gives timely warning concerning the location of hazards and danger zones. With over 90 years of experience in providing quality service to clients in all sectors, Hoffmeyer assures you that we have a selection of caution and flagging tapes that will meet your every need. To help keep our roads safe, contact your local Hoffmeyer representative today.